Srila Prabhupada says "we are not hindus"
Following are the list of quotes by HDG AC Bhaktivedanta Swami Srila Prabhupada saying "WE ARE NOT HINDUS"
Prabhupada: No, no. Everyone will help us. Maybe... In that way sometimes Hindus are also against. It is not the Mohammedans. Caitanya Mahaprabhu’s time, even THE HINDUS WERE AGAINST HIS MOVEMENT, the brahmanas. They complained to the Kazi that “THIS IS NOT HINDU MOVEMENT.” You see? The sankirtana movement. Therefore Kazi had to take steps to stop the sankirtana movement. So Kazi took step on the ground of complaint by the Hindus. Nitai: That’s similar to what happened in Bombay. Prabhupada: THE HINDUS THEY WANTED TO BREAK OUR TEMPLE, and they broke part of it. You do not know? But India, they have given up the real religious system, sanatana-dharma, or varnasrama-dharma. FICTITIOUSLY, THEY HAVE ACCEPTED A HODGEPODGE THING WHICH IS CALLED HINDUISM. THEREFORE THERE IS TROUBLE. Everywhere, but India especially, they are... Vedic religion... Vedic religion means varnasrama-dharma. That is... Krsna says, God says, catur-varnyam maya srstam [Bg. 4.13]. So that is, what is called, obligatory. Just like law is obligatory. You cannot say that “I don’t take this law.” No. You have to take it if you want to have a happy. You cannot become outlaw. Then you’ll not be happy. You’ll be punished. In Durban we went to that university. You remember? That Arya-samaji? He was speaking that “This is Hindu conception. Hindu conception.” And what do you mean by Hindu conception? A child grows to become a boy. Is that Hindu conception? It is science. When Krsna said, dehino ’smin yatha dehe kaumaram yauvanam jara [Bg. THERE IS NO SUCH THING AS HINDU DHARMA. NO. There is no such word in the whole Vedic literature. You won’t find in the Bhagavad-gita or Bhagavata as Hindu dharma. There is one word as bhagavata-dharma, but there is no such word as Hindu dharma. This Hindu dharma or Hindu... This is creation by our neighbour, Indian neighbour, the Middle-east Muhammadans. They gave the name, Indian people, as “Hindu.” “Hindu” means... There is one river, Sindhu. The Muhammadans, they pronounce sa as ha. So those who were on the other side of the Sindhu River, Hindu River, they were called Hindus. But actually Vedic religion is neither for Hindus nor for Christian nor for... It is meant for the human being. Vedic literature... This Bhagavad-gita, Srimad-Bhagavatam, they are VEDIC literature. Vaisnave jati-buddhih. If one thinks of Vaisnava as belonging to this class, this nation, he has no vision. Naraki. That is called naraki-buddhih. Vaisnave jati-buddhih arcye siladhir gurusu nara-matir vaisnave jati-buddhih. If we think the Deity as made of stone and made of wood, arcye sila-dhir; guruhu, nara-matih, if we accept spiritual master as ordinary human being; vaisnave jati-buddhih, and if we take a Vaisnava as belonging to America or Europe or India... No. They are transcendental. Neither the Deity in the temple is stone, NEITHER THE SPIRITUAL MASTER IS ORDINARY HUMAN BEING, NOR THE VAISNAVA BELONGS TO ANY CASTE. This vision is perfect vision. When you come to this vision, that is bhakti. Tat-paratvena nirmalam. A bhakta has to become purified. Tat-paratvena, being dovetailed with the service of tat, om tat sat. Tat-param. This is the process of devotional service. One should not be designated “I am this,” “I am that,” “I am that.” No. The world should unite. This Krsna consciousness movement is so nice that one should forget that he’s Indian or Hindu or Christian or American. Everything should unite as servant of Krsna. Gopala Krsna: They are saying, they are saying we are not Hindus. Gopala Krsna: They are saying this is not Hinduism. Prabhupada: Everyone should understand God and the relationship with God and act accordingly. Then it is perfect religion. And if there is no conception of God, no carrying out order of the God, that is not religion. That is cheating. But generally they do not accept God—still, he is stamping himself that “I am Hindu,” “I am Muslim,” “I am Christian.” He has no idea what is God, how to abide by His order, and they are fighting that “I am Christian and you are Hindu. Therefore we must fight.” This is going on. Nobody understands what is God. Pseudo religion. Practically there is no religion. If there is no government—you make your law; I make my law—then how there will be peace? That is the position. They do not understand what is God, and “I am Christian” or “Hindu” or “Mohammedan, so let us fight.” That’s all. Dr. Kneupper: Do you think that there is a special way that Hinduism looks upon man’s place in the universe? Mahamsa: THEY WILL SAY THAT THIS KRSNA CULTURE IS HINDUISM. Prabhupada: THEN HE’S A RASCAL. PROVE IT IN THE COURT. KRSNA IS NOT HINDUISM. NEVER.... Is there anything in the Bhagavad-gita that Krsna says, “I am for the Hindus or for the Indians”? Mahamsa: Or puts on tilaka. Acyutananda: Puts on tilaka, he may have the lowest character or the highest standard, anyone, he will be all considered a Hindu. Prabhupada: So this should be taken to court, on the Supreme Court. Prabhupada: THERE IS NO HINDU. It is not.... THEREFORE WE ARE NOT HINDU. Prabhupada: NO, NO. And court can say anything, but then why not put it into the judgment of many judges? Harikesa: ...and what is Krsna consciousness. Acyutananda: It is already established. Prabhupada: You can define anything. That does not mean that your definition is perfect. Actually we have to.... Who...? Suppose Hindu. So who is not accepting Bhagavad-gita? But where is...? In the Bhagavad-gita where is the mention of “Hindu”? Hm? Krsna says that “I am the father of all living entities.” So WHY DO THEY SAY THAT THIS IS HINDUISM? Prabhupada: So this cannot stay in the court. Krsna’s instruction is not for the Hindus. Nowhere it is mentioned. Tamala Krsna: The word “Hindu” doesn’t appear in the Vedas anywhere. Acyutananda: Then why do you use in the Krsna consciousness the Hindu caste marks, Hindus caste marks and tilakas? This is all Hinduism. Prabhupada: NO, THIS IS NOT HINDUISM. Appears like Hindu. Just like you appear like an Indian sannyasi, but you are not Indian. Acyutananda: The judge is wearing a white wig and a British suit. He’s not British either. Prabhupada: No, we are clearly stating Krsna consciousness. Harikesa: Yes, but Krsna is a Hindu god. Prabhupada: That is your definition. Krsna doesn’t say. Harikesa: But my definition counts ’cause I’m in charge. Tamala Krsna: But they are the court. Mahamsa: The chief justice himself was saying like that in Madras. Their opinion will come in their favor. Gopala Krsna: That’s only for disputes between countries, international court. Prabhupada: Yes, it is country—”We are American. They are forcing us to become a Hindu.” This is between country. You have to tackle with intelligence. Mahamsa: It’s become a world issue. Acyutananda: In most books about Hinduism they describe that Hinduism is a cult where they worship many gods and ultimately God is formless. Acyutananda: So we are against that. Then we are not Hindus even philosophically according to that. If you do not know who is God, “imperson,” then where is your religion? We have to tackle things. Prabhupada: Dictionary is not the standard. The standard is the book itself. That is our preaching. You may bring some dictionary made by some fools. No. We have to take reference. Therefore we are presenting Bhagavad-gita As It Is. Acyutananda: Well, even Jesus Christ just said, “I am for all,” but there is Christianity. Prabhupada: Yes, that is a fact. Either God or God’s representative, He is for everyone. Suhrdah sarva-bhutanam. That is the definition of sadhu. Titikaavah karunikah suhrdah sarva-bhutanam. A saintly person..., as God is for everyone, a saintly person is for everyone. Why he should be for Hindu or Muslim or Christian? That is the definition of saintly person. Suhrdah. Suhrdah means well-wisher. So either Christ or any Vaisnava, he is well-wisher for everyone. [break] ...suhrdah sarva-bhutanam. We are preaching all over the world and they are appreciating. Harikesa: So many others have preached Hinduism but have no result. 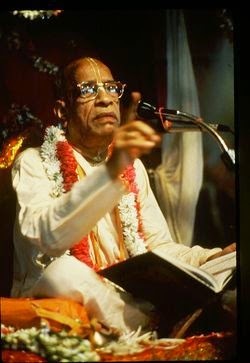 Prabhupada: No result. Why they should become Hindu? Prabhupada: But who cares for Ramakrishna Mission? Hindu monk, but who cares for the Ramakrishna Mission? For the last eighty-five years they are working. How many Hindus they have made? Simply bogus propaganda. Mahesh: The other Swamiji, Swami Kaivalya does not know English. You have heard of Swami Kaivalya? Prabhupada: No, what is his philosophy? He is Vaisnava? Mahesh: Hmmm, I think he is not Vaisnava. But actually, in our Hindu religion, all paths are same and all is one. Prabhupada: All is one? So we can just take your building? Mahesh: Ummm. Actually, Swamiji, there are many Hindu families here in Kobe. They are all interested in seeing you. All have heard of the famous Hare Krsna Swamiji. And everyone will be coming tonight. If the program is successful, they can support one Hindu temple for your devotees to run in Kobe. Prabhupada: WHAT IS THIS HINDU? HINDU MEANS HODGE-PODGE. All is one. This is nonsense. Where is the word “Hindu” mentioned in Sastra? In Bhagavad-gita? In Vedas? Anywhere? Where is this “Hindu” mentioned even one time? Anyplace? One place? Prabhupada: [To Mr. Santanam. ]: You are born in a brahmana family. Any one place? No, this Hindu is a name given by Mohammedans. They cannot pronounce Indus River, so they are calling those on the other side Hindus in their own pronunciation. You know this? [Pause.] You don’t know. But you can learn. To learn, one must approach a bona fide spiritual master and hear from him. This is the process. Tad viddhi pranipatena pariprasnena sevaya. We must serve him and inquire from him. Then he will train us to see the truth. By training we can develop. M. Santanam: Swamiji, who is real guru? Prabhupäda: A guru knows Krsna. So this is the warm invitation of Krishna Consciousness. It has nothing to do with black or white, young or old, or believe me, Christian or Jew or Hindu or anything like that. We consider these to be as much a part of false ego—Christian, Hindu, Jew—as we do black, white, young, old, man or woman. Because they were delegated to this body—I'm born in a Christian family, I call myself a Christian; I'm born in a Hindu family, I call myself a Hindu—so because of this body I'm a Hindu, because of this body I'm a Jew, and if I was born a million years ago would I be a Hindu, Christian or Jew? No. But I'd still be a servant, I'd still have my consciousness. See? Suppose you're born a hundred thousand years from now? Are you going to be a Christian or a Hindu or a Jew? No. But you'll still have your consciousness, you'll still have to serve, and you'll still want to be happy.